Whitley Bay is located in North Tyneside, in Tyne and Wear, England. It is located on the North East coast of the North Sea, and has a stretch of golden sandy beach. The beach forms a bay stretching from St Mary's Island in the north to Cullercoats in the south. We have a wide selection of Pictures and prints of Whiley Bay by some of the North East's top artists and photographers. The town was known as Whitley until the 1890s, at which time the confusion of the name with Whitby, in North Yorkshire, was often causing mail to be misdirected. The final straw came in September 1901 when an ex-resident died in Edinburgh and his body was to be buried in St Paul's churchyard, Whitley. Unfortunately, the body was transported to Whitby by mistake delaying the funeral. The council asked residents for suggestions for a new name, the most popular choice was Whitley Bay. It has since been known as Whitley Bay, but many residents still refer to the town as 'Whitley'. 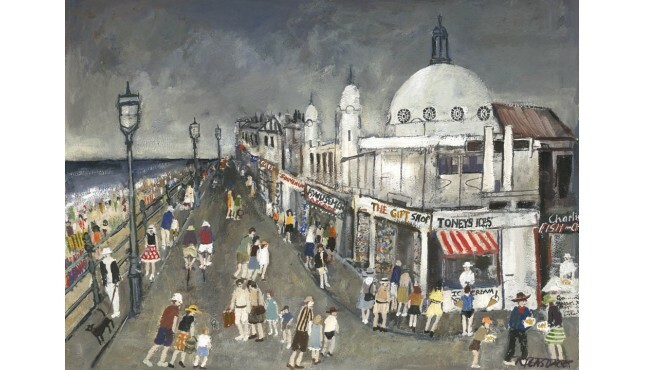 Probably the widest online collection of Whitley Bay pictures are available from artists and photographers on Bridekirk Fine Art. Whitley Bay is a town and seaside resort, with a seafront with walks, a beach, landmarks, and great architecture, such as St Mary's Lighthouse, and a Spanish City Dome. The Spanish City was immortalised in Dire Straits hit Tunnel of Love. Featuring the iconic Rendevouz Cafe. As a kid I got sunburnt there, perhaps you have similar memo.. The wonderfully picturesque St Mary's Lighthouse - Whitley BayFormat: Limited edition G.. I did a quick pencil sketch from the clifftop looking down into Cullercoats Bay and later back in..